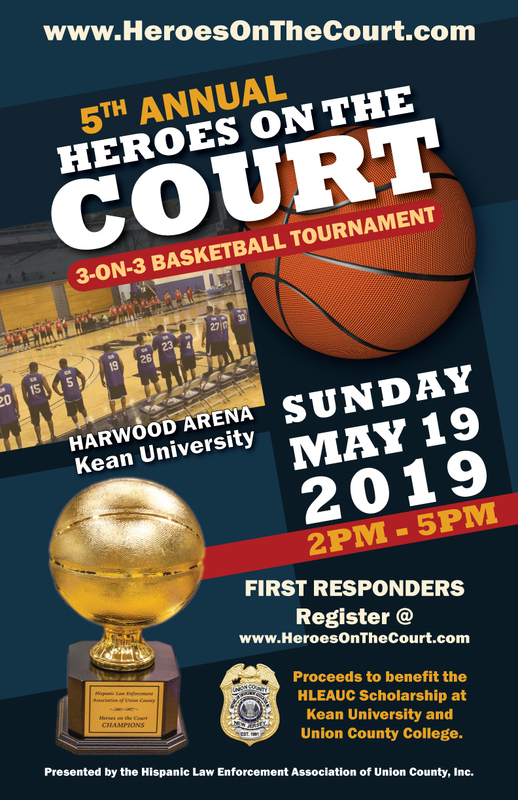 Heroes On Court - PLAYER REGISTRATION ONLY - Events - Hispanic Law Enforcement Assn of UC, Inc. Proceeds from this event will benefit the HLEAUC, Inc. Scholarship at Kean University and Union County College. of two conferences; Blue and Red. Each Conference will have Two Divisions. Division "A" 40 & Over and Division "B" Under 40 division. 3 players plus one sub per team. point is required. (3-point shootout). Prizes & Trophies for each conference champion. All participants must be 18 and over, and submit and agree/sign waiver/release form. You can download the Waiver/Release Form by clicking link below event image.